New Hope for Hearing Loss: Lunch and Learn on Friday, September 7th. 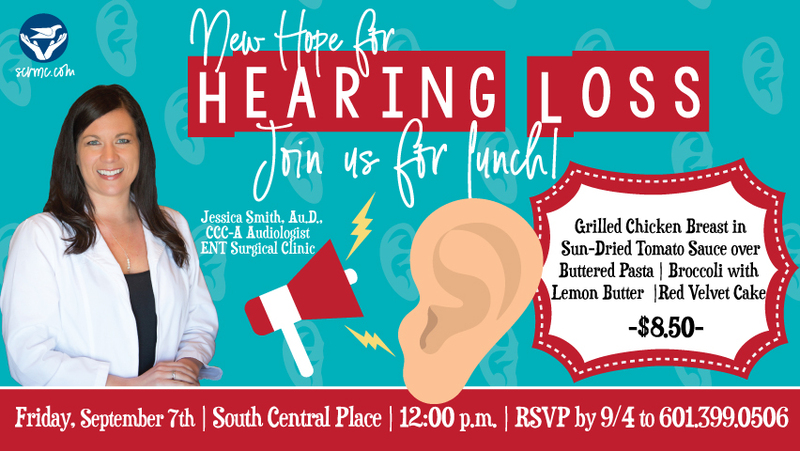 Join South Central Regional Medical Center on Friday, September 7th as Jessica Smith, Au.D., CCC-A Audiologist at Ear, Nose and Throat Surgical Clinic of Laurel, discusses new trends in hearing loss. As technology advances, hearing specialists say hearing aids will continue to get smaller and smarter than ever before. In fact, whether they sit inside or outside the ear, modern devices are virtually invisible. In addition to their tiny size, the newest hearing aids are very advanced, offering users many practical benefits like wireless connectivity via Bluetooth. People who are looking into hearing aids for the first time may be overwhelmed with the amount of information available on the Internet. However, the most important step to take when looking for a hearing loss solution is to seek the guidance of a professional. During this luncheon, Jessica Smith will discuss options available locally to improve your quality of life. Lunch will be served and includes: Grilled Chicken Breast in Sun-Dried Tomato Sauce over Buttered Pasta, Broccoli with Lemon Butter and Red Velvet Cake. Registration is $8.50 and is required by Tuesday, September 4th. To register, please call 601-399-0506 or email kvanderslice@scrmc.com.